[Affiliate News] KKnM 10th Anniversary Sale! This looks to be a busy week for the Visual Arts Society, as we bring to you two of our club’s staple events: Animation Revelation and Art Fiesta! The Visual Arts Society’s big event, ARTS FIESTA , is here once again! 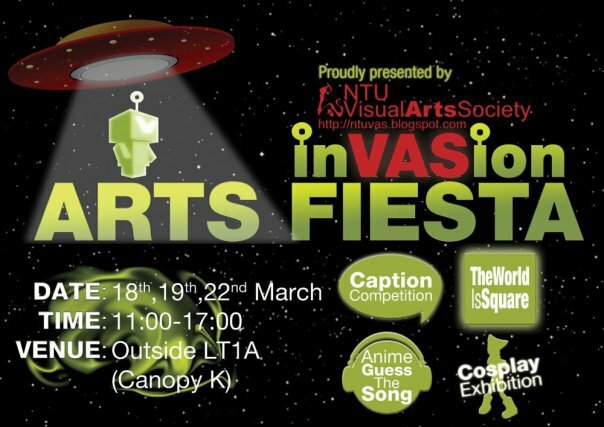 A mega event starring all three aspects of the VAS, AnimeWorks, Comics Ensemble and Designer’s Club, with our powers combined, we’ll be bringing you a veritable festival of activities and fun, right here in NTU ON CAMPUS. Catch the Fiesta outside LT 1A on the 18th, 19th and 22nd of March 2009 from 10am to 5pm. Expect a shopping bazaar, air-brush tattooing, competitions, performances and lots lots more. So what do we here at AnimeWorks have in store for you at the event? Read on to find out more!